How to vote or vote NONE. - Register before 22nd May to vote in the UK General Election on 8th June 2017. The website, can be used (i) to register or (ii) to update your details. If you have a National Insurance number, you'll need it. (Tip: to avoid receiving ads in the post, tick 'No' to being on the Open Register.) At the end you see a summary of your answers to confirm. 2. Vote in person? or by post? You can choose to vote in person or by post. Voting in person is interesting as you see the whole process and take part in it. But if you might be away on election day, or busy, apply now for a Postal Vote. Take it with you to vote. If you lose it, you can still vote. Just remember where to go, or ask a neighbour. In advance, think whether you can help other people to get to the polling station, who may be busy with work and family, or disabled, or elderly, or have no transport. If you have registered to vote by post, you will receive the postal ballot paper. Follow the instructions carefully, and post it several days before election day to be sure it arrives in time. 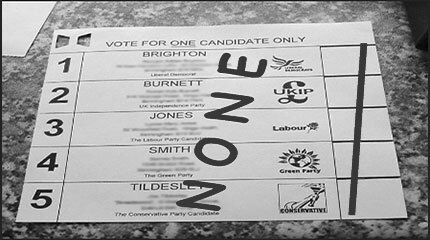 To vote NONE, see 4b. below. On election day UK Polling Stations are open from 7am to 10pm. It's usually quieter in the morning, and busier after work and in the evening. Inside, the official staff will ask your name and tick you off the list. They will give you a ballot paper with the list of candidates to choose from. Take it into a polling booth (cubicle), to be private. To Vote, put a cross in one box beside the name of your chosen candidate, as shown below. ● Don't put a tick or cross anywhere. ● Don't write anything more. Fold it for privacy, and put it in the ballot box. Mistakes: If you make a mistake on the ballot paper, you can ask for a replacement paper. The officer will take the unwanted paper from you. Confidentiality: Nobody will ask you how you voted. You don't need to tell anyone. It's your private decision. If you leave your decision to the last minute, or change your mind at the Polling Station, there's a chance you'll regret it. So decide calmly in advance, and have confidence in your decision. Don't be scared or put off by others, or by newspaper headlines trying to influence your vote. Voting is a simple but amazing democratic process. A strong democracy is the only alternative to being controlled by dictators or wealthy corporations. The priority is to make our democracy stronger, both through visible protest and through electing better people. Counting starts when the polls close, and it carries on right through the night and into the next day. Watching the results come in can be fun, especially if you are celebrating or commiserating with friends. is the Electoral Commission’s website with information about voting and registering to vote.